So we have been in Bordeaux for almost two months, and I can tell you now that the experience has been great! We have met so many people here at our school –Bordeaux Ecole de Management (or BEM as they call it)–, we’ve gone on some great trips, and we have enjoyed the business classes in school. Bordeaux as a city is extremely beautiful, and we can’t wait to take many more walks in the city once it gets warm! The first week we got here and we were a little lost. None of us knew the school, the city, or the other students. The international group here (the Melting Potes) organized many little outtings for us to meet the other international students and some French kids, and we did just that! I can’t even count how many people I’ve met, but I can tell you that I have definitely met some life long friends here. We started our classes January 12, and luckily, we knew almost half the students in our class because they were international students, but there were also many French students. I was very impressed to know that French students would take an upper level business class in English, but they did great in the class! We had two professors in this class-one Australian and one American. We had some amazing discussions in class, but some particularly stuck to me. One day, we presented something about the economy in our home countries, and I was surprised to know that 15 countries were represented in our class! That seemed like such an enormous amount! The class only consisted of about 50-75 students, but there were 15 different countries and cultures represented within those students. This week we will start a new class for the next three weeks, so we will let you know how it goes! We have taken some amazing trips in these past 2 months that I will never forget. Our first weekend trip was to the Pyrenees for a ski trip. Matt, Hassan, my Swedish roommate, and I went skiing with a ski group from our school, and we had a blast! I had only been skiing a few times before, but to say that I skiied down a few mountains in the Pyrenees is a great accomplishment! Our next trip was to Paris. Ryan and I went for one day and night, and we visited a friend, Clementine, who was actually a French exchange student at the University of Louisville from Bordeaux last fall. In Paris, we got to see Notre Dame, Mont Martre, Sacre Coeur, the Moulin Rouge, and the Eiffel Tower, and we also had dinner with Gaelle (the other exchange student from Bordeaux). We did all of this in one day. Clementine was a great tour guide, and we enjoyed seeing her and Gaelle at least for a little bit. I’m sure we will be visiting them again very soon. After Paris, I went to visit my grandparents in Provence and then my grandparents in Nice. It was so great to see them even if it was only for a few days. I usually only get to see them once a year in the summer, but I have gotten to see them in January and February this year. I am so grateful that I have this opportunity to study in France, the country I was born in and have loved for all my life, but also to be able to see my grandparents fairly regularly. It has been such a blessing, and I will always cherish this amazing opporutity I have been given. In Nice, Ryan joined me, and we saw the Carnaval de Nice. My parents have told me about carnaval all my life, and it was great to finally see it! Kids were spraying silly string and throwing confetti everywhere as large carnaval objects made their way through Nice. We brought my twelve year old cousin to see it with us, and we had such a great time! This past week, we have been traveling as well. On February 20 we began by taking a train to Brussels. We spent a few days in Brussels, then went to Amsterdam for three days, and then to Berlin for three days. Each city was very different from the others, but I loved every one of them. I had never thought of going to either of these places, and I just went along with the trip because Ryan, Hassan, Matt, and my roommate Annika were going, but I am extremely glad to have gone! Brussels was a very charming city. We ate many delicious meals, and very much enjoyed the Belgian waffles. In Amsterdam, I was surprised by how beautiful the city was! The canals, bridges, and apartment buildings went very well together to form a gorgeous city. In Amsteram we also visited the Van Gogh museum and the Anne Frank house. We haved learned so much about Anne Frank, and it was unreal to see the house in person. When I was standing in her room, I was taken aback by the fact that this was her room. This was were she spent hours writing her diary and afraid for her and her family’s life. This part of Amsterdam was probably my favorite, and will definitely leave a great impression on my life. Berlin was definitely my favorite city out of the three we visited. Our first day in Berlin we went on a six hour walking tour, and I fell in love with the history. I had never realized how much history can come from one city! The history we had already known from World War 2, combined with the stories our tour guide told us, made the city that much more interesting to me. I remembered all I had learned from our history classes in school, and I couldn’t believe I was in the very spot much of this history had taken place. Tonight I am actually writing from Berlin. Tomorrow morning we will visit a concentration camp just outside the city, and then we will get on a fourteen hour train ride to Paris. Sunday we will be back in Bordeaux to continue with school. All in all, my study abroad experience has gotten off to a great start! Thank you very much to Betty and David Jones and Dean Goately for making these experiences possible. I have already done much more traveling than I have ever imagined, and I have learned more about myself in these past two months than I had in the first two years of college. I can’t wait to travel more to places I have never been, meet many more people, and learn a great deal both from the classes at BEM and my wonderful experiences. 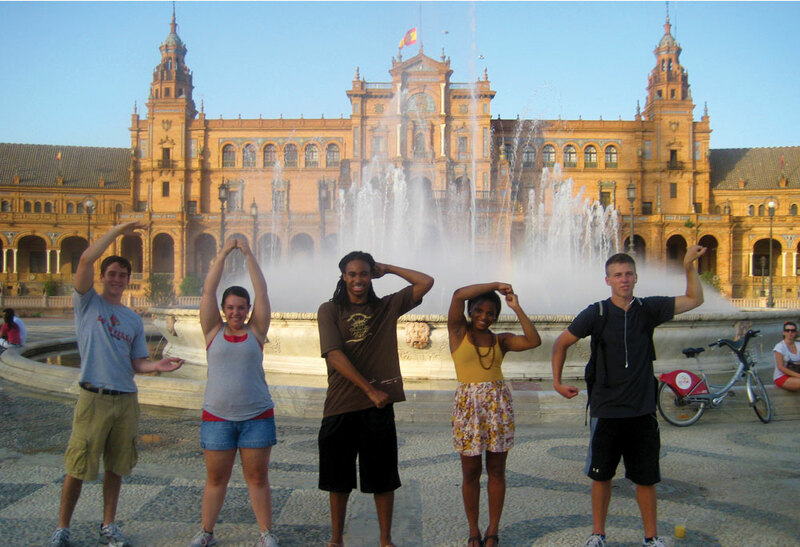 This entry was posted in Study Abroad by Aurelia. Bookmark the permalink.